Identifying climbing vines is usually easier during the summer months when the vines have flowers. As with any plant identification, note the leaves, flowers, and growth habits of the vine. Get a good field guide to local flora and use the most striking feature of the vine for identification purposes. Clematis is a flowering perennial vine found in many gardens. It's easily identified by the flowers which range in color from white to dark purple. Clematis flowers during the summer and has medium green leaves. Honeysuckle vines can be identified by their fragrance, flowers and blooming habit. The fragrance is perhaps the first thing most people notice. When honeysuckle vines bloom, the sweet, rich fragrance smells like perfume. The flowers may be white, yellow or orange, and sometimes turn different shades over time. Look for honeysuckle growing wild along sunny fences or shrubs. Morning glories can be identified by their blooming habits. Morning glory vines produce large, saucer-shaped blue, purple or magenta flowers. The flowers only bloom in the morning and close up around noon. Found growing along fences, trees, and hedgerows, the invasive trumpet vine is easily identified by its large, orange tubular shaped flowers. This very aggressive vine loves full sun. Hummingbirds often feed upon the flowers. Ivy is one of the climbing vines that does not flower. The leaves are pointed and may be many shades of green, ranging from light green to dark, with variegated colors possible. Ivy climbs posts, fences, and walls, and the tendrils may actually damage mortar if left unchecked growing on walls. Grapes are another type of climbing vine, although you may not immediately think of them when you're trying to identify vines. If you've bought an old farm and notice the thick, twisty stems and spade-shaped leaves, you just may have a grapevine. Of course the best way to identify a grapevine is to wait until the fall when the clusters of fruit develop. Wax plant is a succulent grown outdoors in USDA zones 9 through 11 and in cooler regions as a houseplant. The 3-inch long waxy, oblong leaves are green or variegated and are evergreen. Throughout the year, the vine produces its unusual and fragrant flower clusters, with the center of each small, waxy flower having a star. Flower colors are white, pinks, purples or reds. Within its growing range, you can find wax plant scrambling up to 20 feet long in a bright location. Virginia creeper puts on a stunning display of fall colors ranging from orange to red, making it easily misidentified as a wild grape vine due to their foliage being so similar. This pest- and disease-free North American native is hardy in USDA zones 3 through 10. The green palmate leaves have a deciduous habit and in fall, the vine produces bluish-black berries. Reaching a height of 50 feet, Virginia creeper tolerates a wide variety of conditions from sun to shade and various soils, including those that are wet. Blackeyed Susan vine performs as an annual in all locations, but grows as a short-lived perennial in USDA zones 10 and 11 and in a sunny to partially sunny location. This quick-growing vine averages around 10 feet in height and puts on a stunning display of orange and yellow flowers with dark centers summer throughout fall. In frost-free climates, the green triangle-shaped foliage is evergreen. The colorful vine graces fences, containers, arbors, and trellises in the garden where it's hardy. Climbing or creeping fig, typically found growing on houses or fences, is a hardy, evergreen vine quickly reaching heights of 40-feet without the need for support and is hardy in USDA zones 8 through 11 in shady to partially shady sites. Green foliage is small and oval-shaped and green, inconspicuous flowers bloom in spring. As the vine matures, it may produce fig-like fruits, but this isn't common. The vine is an aggressive grower but frequent pruning keeps the vine under control. Air potato vine is an invasive vine quickly growing to 70 feet and covering trees, fences, or utility poles. It grows wild throughout frost-free zones. The green, heavily veined foliage is heart-shaped, and though not common, the vine produces white inconspicuous flowers. Dense, brownish tubers up to 6 inches long and resembling a potato, thus the name, forms along the leaf axils. Climbing hydrangea is a slow-growing deciduous vine with densely packed and attractive deep green, ovate foliage surrounded by flattened clusters of flowers that are usually white with only the outer ring fully blooming. 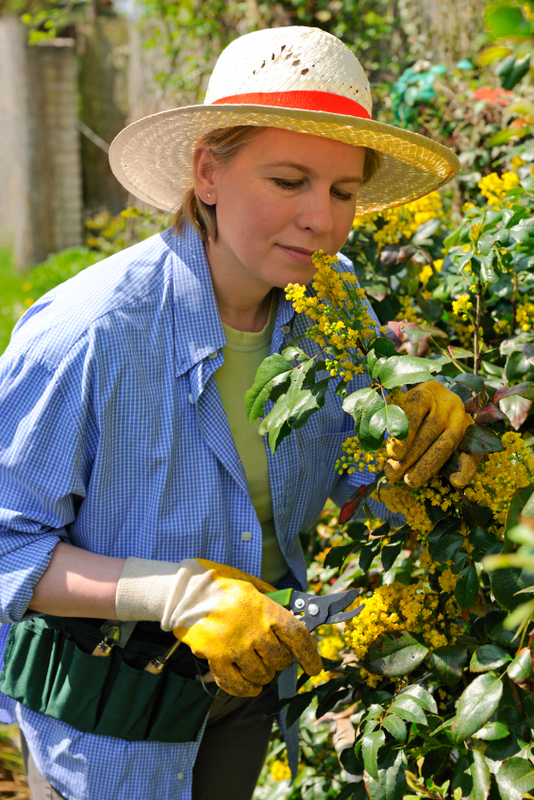 Flowering starts in early summer and you will typically find it growing in the landscape on fences, trellis, or arbor. It is hardy in USDA zones 5 through 8 and performs well in shade to full sun and in fertile soils that drain well and grow up to 60 feet tall. With its scarlet flowers attracting hummingbirds and butterflies, red passion flower vine puts on a riot of color summer throughout fall and make the vine easy to identify in the garden. The vine quickly achieves a height of 50 feet and the green ovate foliage is evergreen and after flowering, the vine produces yellow, edible fruits. It grows as a perennial in sunny sites located in USDA zones 9 through 11, though in cooler regions it grows as an annual during the warmer months. Closely related to the edible sweet potato, ornamental sweet potato vines still produce tubers but aren't tasty and hardy throughout USDA zones 9 through 11. Depending on the cultivar, leaves are heart-shaped to palmately-lobed and up to 6 inches long, ranging in colors of dark purple, lime green, and variegated. During summer, inconspicuous pinkish flowers form, but go unnoticed as the lush foliage covers them and some ornamental types don't flower at all. The hardy vines quickly grow 10 feet long or more and you usually see this vine growing as a ground cover. Moonflower vines are relatives to morning glories and though an annual, the heirloom vine readily grows in the wild throughout warm, frost-free locations of the U.S. It was an old-fashion garden favorite that is underutilized today. Its habit of blooming in the evening, producing large, 6-inch white flowers, make it easy to identify, as most plants bloom during the daytime hours. The vine quickly grows 16 feet tall or more and foliage is green and heart-shaped. It's the same plant used to grow hops, which are made into beer. Hops vines can be identified by their serrated leaf edges and the clusters of hops hanging off the vine, which look like pine cones. Hops are used to brew beer and flavor foods. Dodder vine, also called strangle vine and love vine even though there's nothing to love about this parasitic vine, quickly reaches a height of 60 feet and a width of 30 feet. It can completely cover entire stands of plants with its distinctive orange or bright yellow twining stems without any foliage and weaken them to the point of death. It rarely flowers, but produces inconspicuous small white flowers when it does. It grows throughout the entire U.S.
Identifying climbing vines is usually fairly easy, especially during the summer months when most vines begin blooming. Get a good guidebook or tip sheets from your local county Cooperative Extension office and compare pictures of plants to what you have found in your garden or in the wild. Note the flower color and shape, leaf color and shape, habits, and any special features such as fragrance or attraction for hummingbirds. Soon you'll be an old pro at identifying climbing vines.